Before we learn how to make soup, let's talk about the difference between soups and stocks. 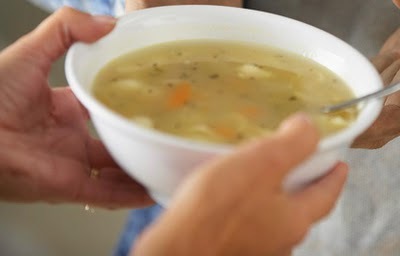 Although many times people think that soup and stock is the same thing they are in fact different. You will need to make your stock before hand, to go into your soup. Stocks are very important and are a key ingredient in soups and sauces. A stock is a liquid, which has been simmered down often with bones, meat and vegetables in it; you can have many different types of stocks. These include beef, fish, chicken and vegetable stock all of which are easy to make. Stocks work well with tougher cuts of meat as tender meat will break down too easily. When making chicken stock it is best to use the whole chicken to get the best flavor. Many people advise browning the bones before adding them to the stock, this is ideal if you want a dark rich color and is great for brown sauce. Simply roast the bones and vegetables, until they turn brown then add them to the liquid. Herbs can be added to the stock and they are usually added an hour before the end of the cooking time. Salt should be avoided as the meat and bones will naturally have salt in them. Taste the stock once it is cooked and then season according to your taste. Once your stock has been brought to a boil, then it should be left to simmer for at least an hour. During the simmering process a great deal of impurities will float to the top, you will need to ensure that you skim these off. Once the stock is cooked you will need to strain it to ensure all of the bones and cooked vegetables are removed. You can then add other ingredients to make a soup, or freeze and use another time. The stock is ideal for helping your soup taste amazing and once you have stock on hand and frozen you will be able to make soup whenever you want it. Follow the directions above and use any of these ingredients you have to make your stock. Cut vegetables in pieces, quartered or cubed. To make turkey stock, use the directions above on making stocks. Use any of the vegetables you like from the list of vegetable stock and add turkey bones. I like making a turkey stock after Thanksgiving with all the leftover turkey bones including the neck. Follow the directions above and use any of these ingredients you have to make your beef stock. You can add more vegetables to the stock if you'd like. Every culture has their own version of soup and there is a recipe for every type of stock and soup you can make. Soups are very popular because they are a cheap easy meal alternative and are packed full of vitamins and nutrients. Soup is a great way to use cheaper produce and even leftovers, which will save you money. Remember that a good soup can't be rushed, although many people think you simply boil vegetables and that gives you soup. There is slightly more to it. You have to ensure that all of the vegetables are evenly chopped and that you allow enough time to slowly cook your soup. Soup should cook on a low heat for a good amount of time. 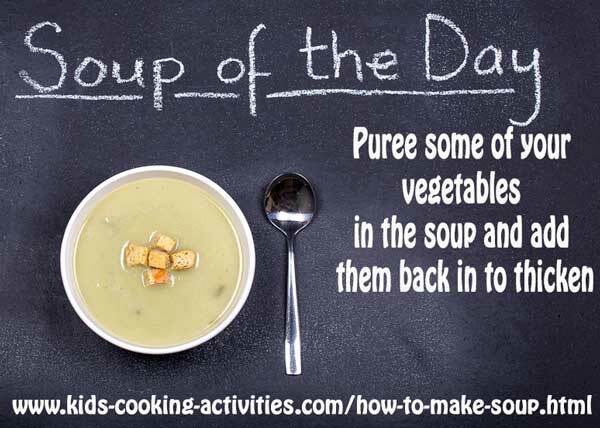 Puree some of your vegetables in your soup and add them back in to thicken. Add 1 Tablespoon cornstarch to 2 Tablespoons liquid and then add to your soup to thicken your soup. It is easy to make cream soups by blending your cooked soup with an immersion blender or pouring soup in the blender to puree. Then add back to your pan. 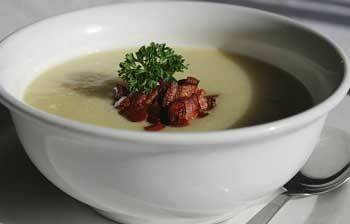 You can puree the whole soup for a pure cream soup or puree half the soup and add back to the rest of the soup. 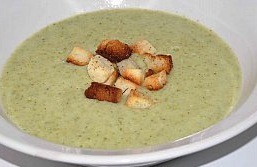 You'll love this homemade cream of broccoli soup recipe. My kids prefer it chunky whereas I like it creamy so I usually split the recipe in half when it is done and blend half and leave the rest as is for the kids. Heat oil in soup pan and cook onion and potato cubes. Saute. Season with salt and pepper. Add chicken broth and cook until potatoes are slightly tender. Add broccoli to soup pan. Cook until broccoli and potatoes are tender. Add milk and cheese and stir until cheese is melted. Add to blender and puree into cream soup or use an immersion blender. Cut vegetables into slices or cubes. In soup pan place potatoes, onion,carrot, celery and cauliflower. Add water to cover up vegetables. Cook and simmer on medium until vegetables are tender. Add half of soup mixture into blender. Add bouillon and milk to blender also. Puree several seconds. Add back to saucepan and stir together. Allow to cool and then freeze in smaller containers. ~~Normally potatoes don't freeze well but since you are running the soup through the blender it will work well for the freezer. In a soup pan, saute onions, garlic and celery in oil several minutes. Add bay leaves. Add potatoes, salt and pepper. Stir and continue 5 minutes saute all vegetables. Add in broth and cook 15 minutes. Stir in cauliflower and cook an additional 15 minutes until cauliflower and potatoes are tender. Take out bay leaves and blend until smooth. *My kids prefer their soup chunky so I usually split the soup in half and have half cream soup and half chunky soup. 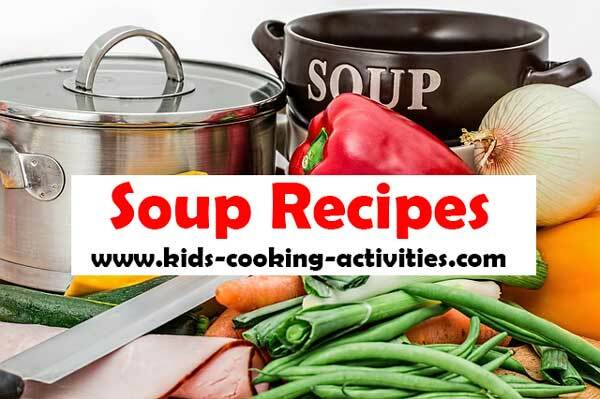 These cream vegetable soups are great for learning how to make soup, you can try other variations like cream of pumpkin or squash. Learning how to make soup from broth is different than creamed soups. The key ingredient in broth soups is the stock or broth. Then other ingredients are added to finish the soup. Saute the onions and garlic in olive oil until soft, about 3 to 5 minutes. Add the spices and cook for one more minute. Add the vegetable broth, chickpeas and couscous. Bring to a slow simmer and cook for 3 to 5 minutes. Stir to fluff the couscous. Allow to sit for a few more minutes, if needed, to allow couscous to finish cooking. Garnish with mint and parsley and serve hot. Hearty stews make great warm meals that will fill you up. 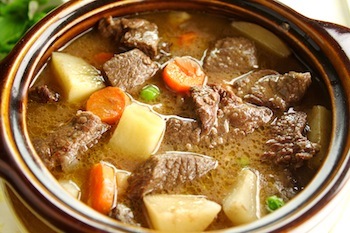 Beef stews, chowders or soups with lots of filling ingredients are included in this category. Add potatoes, corn and soup to your crock pot. Stir in water and mix until well blended. Season with salt and pepper. 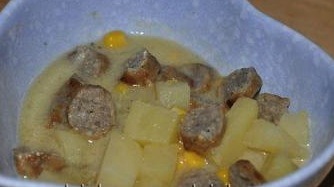 If using sausage add to the soup and cook 6 hours on low. Share a how to make soup recipe?